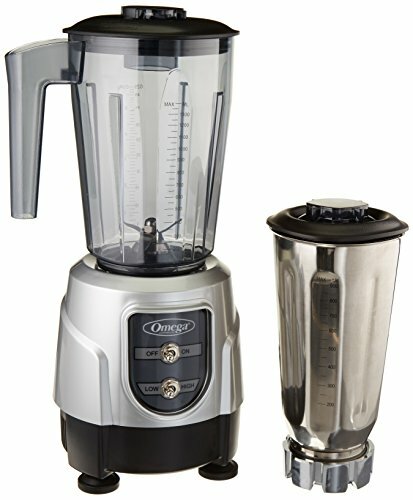 Looking for a sleek looking blender with stainless steel jar? You're in the right place! We've compiled several blenders here that have jars NOT made out of plastic or glass. PS: We wouldn’t recommend this ourselves, but this person (in the video below) managed to fit a Waring Stainless Steel Container on a Vitamix. Designed for commercial use, this blender is incredibly powerful and features not only a stainless steel container that is 32-ounces, but also stainless steel blades that can chop through any ingredients without problems. To dampen the noise created when this blender is working, the clutch is made from metal and rubber, which also serves to help increase the durability of the blender. You don’t have to worry about the blender moving across the counter when it is working, as the feet are “sure grip” and are specifically designed to help hold it in place. There are no advanced settings on this blender, and the on/off toggle makes it incredibly fast and easy to use. The large 64-ounce stainless steel container on this blender means that you will be able to quickly blend large amounts of food without having to worry about the blender being too full or about having to blend in batches. The commercial motor is designed with two speeds so that you have a little more control over what you are blending, and because the blender can reach 24,500 RPM when turned to high, you won’t have to worry about whether or not it will have enough power to thoroughly chop and blend all of the ingredients that you put in the blender. The removable cap on the blender is clear so that you can easily see how your drink or smoothie is coming along. This powerful blender offers variable speed control so that you can easily make adjustments to your blending, chopping, or grinding, which will ensure that you have the final product that you want. The three HP motor is able to chop through most anything that you want, and the unique blades make sure that you don’t have to stop blending to tamp down ingredients. Because this blender is able to pull ingredients down, it can provide you with a consistent blend of all of your ingredients. The large jar is very easy to clean, and thanks to the rubber gasket lid that locks in place, you don’t have to worry about there being any leaks when the blender is in operation. This advanced blender makes it incredibly easy for you to not only roughly chop ingredients thanks to the pulse button, but also to control the speed of your blender using the variable speed knob. This means that you can start out your blender a little slower if you are worried about whether or not the food you are trying to blend will be too tough for the blender to get through, and then you can gradually increase the speed as you see it to be necessary. The speeds are adjustable from 1,700 to 18,000 RPMs, and since the motor is designed for commercial use, it can be used for very long periods of time without any problems with it overheating or breaking, making it ideal not only for use in a restaurant, but also for at home if you want to be able to make large batches of frozen drinks or smoothies for a party. 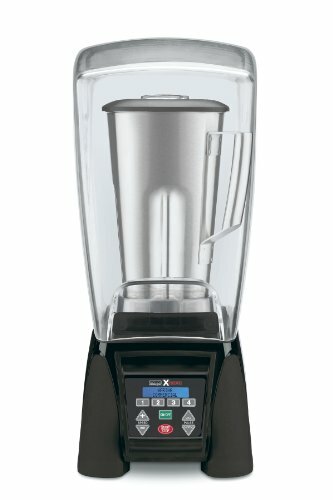 This blender is unique in that you can choose from a durable plastic container or a stainless steel container, which means that you will be able to pick the right one for your current blending needs. The controls are incredibly easy to use, as you can toggle between on/off and low/high, which means that anyone can learn how to use this blender without a lot of problems. Thanks to the large cooling fan that is a part of the blender, there is a very low chance that the blender will overheat when you are using it. Additionally, the compact base ensures that the blender doesn’t take up too much room on the counter and that it won’t move around when turned on. Being able to put the blender back on the base on the counter and out of the way ensures that you are not frustrated by a lack of space in your kitchen when you are trying to prep for a meal. 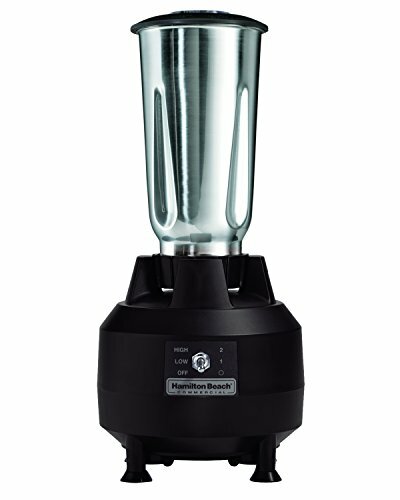 This blender is not only large, with a 64-ounce capacity, but it is incredibly powerful and comes with a sound enclosure to ensure that it does not bother anyone nearby when it is working. Thanks to the re-programmable speed control, speed and time selections, and pulse feature, you will be able to blend anything with perfect control and not have to worry about the final result. The electronic membrane covering the controls is durable and easy to wipe clean so that there isn’t any concern over the buttons being damaged or too dirty to easily see and use. 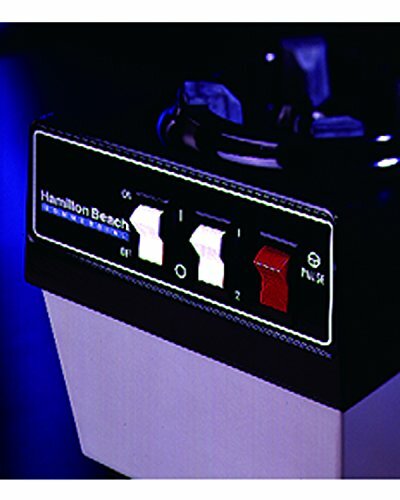 The four re-programmable stations make it simple for you to see the programs for optimal blending, which will speed up the process every time you need to make a drink. While you can buy this blender without the sound enclosure, because the blender is so powerful you will really want to include this in your purchase. It’s the best way to ensure that you do not hurt your ears if you are in charge of a lot of blending throughout the day. While some commercial blenders only feature an on/off toggle, with this blender you can control two different speeds and have the option of using pulse to better chop or layer ingredients over each other for your recipe. The container has two handles on it, which makes lifting it when it is full incredibly easy and decreases the likelihood that you will accidentally drop the jar. Additionally, the latching cover will stay in place, no matter what you are blending, decreasing the fear of making a mess when you are making a drink or prepping for a meal. The two-year parts and labor warranty that comes standard with this blender will help you rest easy knowing that if there is a problem with the blender that you will be able to have it taken care of without any problems.